We all do it. We regurgitate what Bono says. I’ve been known to repeat, or re-craft, those infamous statements he says which are embedded in our DVD collections of U2’s live shows, movies and videos. It’s charming and a challenge to take a brilliant statement and try to work it to your advantage. Make it sound like you are the one who is virtuoso in linguistics when all you are really doing is stealing it from the hipster Bono. My first encounter of the quotable rocker was when I saw U2 for the very first time in Iowa City on the Joshua Tree tour in 1987. 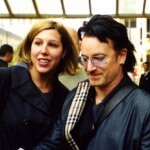 I guess Bono took a spill in Washington DC a month prior and he spent 12 shows on the tour with his arm in a sling. The night I saw the band, he was relieved of the harness he had used for his dislocated shoulder and dedicated Trip Through Your Wires “to my once broken and now mended arm.” The Irish accent on “arm” was very Brogue. We tried to get it right several nights later over pints of Guinness at the Sanctuary on South Gilbert Street. I attest. We couldn’t get it right no matter how much we drank. Bono arrived a couple minutes later. The rush was on. Several people ahead of me got their photos taken with him as he graciously signed memorabilia. 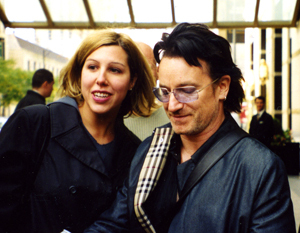 I approached Bono with the CD insert of The Joshua Tree in my outreached hands. He took the booklet began to sign it. I interrupted him. He stopped. Look at me through his blue tinted shades. “How do you know about the monkey dancer?” He smiled. His eyes were like glowing crystals behind his shades. He gave me back the signed booklet and shook my hand. He turned and nodded to Edge. They climbed into the second limousine and drove off. It was the perfect end to their fall visit to Chicago. It elevated my spirits as I was jobless and in a haze after the events of the month before in New York City. Above photo taken moments before our monkey dancer conversation took place. Share your favorite quote. It doesn’t have to be a personal encounter. It may come from your favorite live show nestled in your DVD, or VHS, collection. It could come from a media event. Please specify where you lifted it from. Let’s have fun with this little project. In college my sister & I would write letters to each other using only U2 lyrics. When Bono would say something in Latin that we couldn’t understand (“Boy”) we would use English words that sounded similar, even if they made no sense. Even now, 25 yrs later, we communicate the same way, only now we text each other. No one else can make me laugh like that! I spent a lot of time analyzing that statement. Did he mean the band were fans of their fans? Or did he mean the band were fans of themselves? I finally decided he meant that the band has always believed in themselves and are big fans of what they were and are doing.